“Welcome to the real world!” –You might’ve said this phrase to your fresh grad, likely more than once. They’re done with schooling, and now that they’re trying to figure out the first step of adulting, how about giving them something that can help in their personal tasks – online job hunting, searching office locations, or simply passing time while waiting for appointments. For your new grown up’s adulting essentials, Samsung has the perfect gift options: its latest Galaxy A8 and Galaxy A8+ models. With their superb specs, these units are perfect for everyone. But if you also put a premium on your budget, you’re in for a surprise: thanks to Home Credit’s 0% interest promo until the end of March, you can now give your freshies the gift they deserve without draining your funds: through 9-month installments, even without a credit card! Just approach a Home Credit sales associate from any of the participating stores, submit your filled-out form together with your two (2) valid IDs, and wait for a few minutes to get approved! 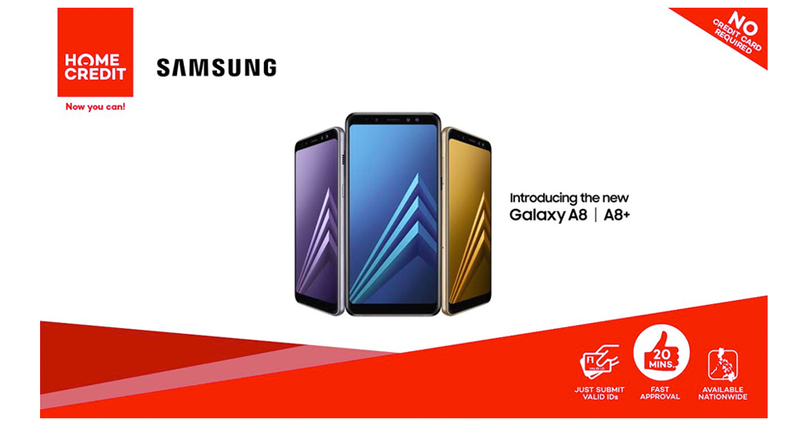 The Samsung Galaxy A8 and Galaxy A8+ come in colors that let your style show, complementing their young-professional getup. These two sport the biggest display for Galaxy A phones to date, giving the user a stunning cinematic experience. Of course, with superb display come splendid cameras – dual front cameras! Both their front and rear come in 16MP, which make selfies and wefies just as good as portraits from pros. And with their customized settings and variety of filters, snapping a masterpiece is super easy – just press the shutter! For adventurers who are always-on-the-go, Galaxy A8 and Galaxy A8+ can keep up – with the water and dust resistance, these phones will never slow them down. No worries on the splashes or rain; they can go wherever life takes them! It’s not all about aesthetics. For new professionals who are seeking a direction in their career, these Galaxy A’s can help in every step of the way with the virtual assistant Bixby. They can keep the day on track, set reminders, and store any kind of information – Bixby can keep up with their young, fast-paced lifestyle. Seems too much to handle? Galaxy A8+ works on a 6GB RAM and octa-core processor, with an internal storage of 64GB – that’s more than enough to handle such tasks! As always, Samsung knows the dynamic way of life. The Samsung Galaxy A8 and Galaxy A8+, priced at Php26,990 and Php32,990 respectively, are ideal for the young go-getters who are ready to explore the world. And as an offer for you, dear guardians who are behind their success, Home Credit made it even more budget-friendly; with their 0% interest rate promo, you can go for 9-month installments. So give your fresh graduates the gift they deserve, make it stress-free on your part! “Everyone can choose a Samsung phone that suits their style – there’s always one that’s made for them, and fresh graduates are no exception! That’s how we keep it exciting for the customers: offer them good phones that fit their budget, at zero interest rate,” said Home Credit Philippines Head of Sales Petr Korinek. You may visit www.homecredit.ph for more information on Home Credit’s promos for Samsung, store locations, and loans.